If you’re an avid trampoliner but are looking for something new and exciting, we highly recommend investing in a bungee trampoline. If you’ve never heard of one before, or have heard of them before and are considering investing in one, you’re in the right place! Today, we’re going to be introducing you to everything bungee trampoline – what they are, why you’ll love them, and the top 7 bungee trampolines that we picked to review based on our high standards. 1 What is a Bungee Trampoline? 4 Have You Tried A Bungee Trampoline Harness? What is a Bungee Trampoline? A bungee trampoline is a trampoline that uses bungee cords instead of springs. If you’ve never felt the difference between a bungee jumping trampoline and a traditional spring trampoline, now is the time to find one. Each bungee trampoline for sale in our review list has caught our attention in their own unique, individual ways. Keep in mind, however, they are not ranked based on favoritism. The Classic 39” Bungee Trampoline by bellicon has a number of prices available. Each bungee trampoline price is anywhere from $459 to $529, based on the bungees you choose. The variety of bungee cords available covers every weight class possible, but all are silver in color. Aside from the bungees, the frame is made of German-engineered, industrial-strength steel, coated with a high gloss black powder. The legs of the trampoline screw in, which calls for an easy setup. What’s more, it comes with a free 90-day membership for bellicon Home, which is a fitness program specifically designed for your new bungee trampoline. 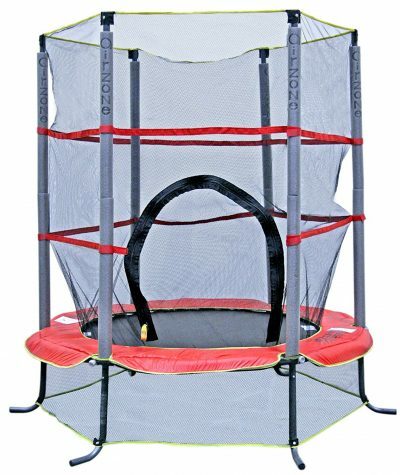 The 250 Premium Bungee Trampoline by JumpSport is currently on sale for only $250! It’s made with their patented EnduroLast-2 bungees that last twice as long as traditional bungees, offering up to 40% more reduction when compared to a typical trampoline. Paired with their patented No-Tip arched legs, which are easily attached to the frame, stability and durability are guaranteed. The patented padded petals are in charge of covering the bungees to give the jumper up to 60% more space, giving you a total of 1030 sq inches to move and bounce around on. It has a maximum weight limit of up to 250 pounds, with a frame that is both sealed and protected by a durable, double coat black finish to aid in longevity. 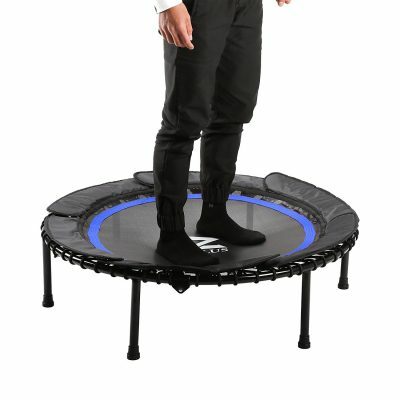 An exclusive exercise DVD comes with the bungee cord trampoline, and a residential use warranty that covers the frame and the legs for life, the mat and the EnduroLast 2 cords for 2 years, and 1 year for the remaining components. 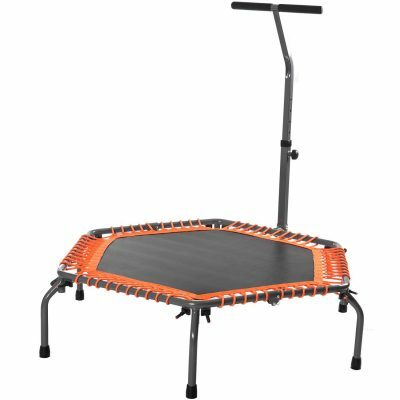 The Foldable Mini Bungee Trampoline by Z ZELUS is currently priced at $80 if you want it in Orange, or $83 if you want it in Blue. It’s constructed using carbon steel tubes, anti-skid feet, and a solid, carbon steel frame that features straight, screw in legs made of thickened steel and rubber feet pads. The 8mm thick bungee ropes are made of nylon, while the jump mat is made of a mesh fabric and polypropylene. It also features reinforced elastic strings to grip the platform and keep the trampoline as quiet as possible and without corrosion. The 40” of jump space, which can hold the maximum weight of up to 221 pounds, is easily folded in half for convenient storage purposes. It has covered edges that give a full, gap-free platform to give you more room without sacrificing safety. Finally, it’s backed by a 1-year warranty and a guaranteed free exchange if the model you receive is defective in any way. The 40” Foldable Trampoline With Adjustable Handrail by KLB Sport can be yours for as little as $100. It’s suitable for both indoor and outdoor use. It has a foldable, portable design that includes collapsible legs to ensure that no component gets in the way when it comes to storing it for a while. The frame tubular steel with a coated finish for added durability. To prevent your feet from going through the bungee cords, the safety padded cover fits snug around the frame. This bungee trampoline for sale has a maximum weight limit of up to 220 pounds and an adjustable handrail that adjust from 39” up to 48”. It comes with a 2-year warranty, but you can also opt for a 4-Year Protection Plan for $18 or a 3-Year Protection Plan for as little as $5. 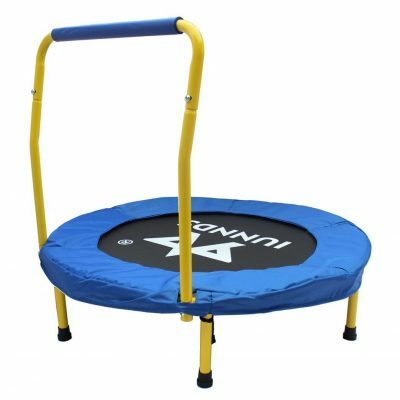 The 36” Mini Foldable Trampoline for Kids by KLB Sports can be bought in Yellow or Blue & White for a measly $60. It’s made of a durable, tubular steel frame with a coated finish and a padded cover that goes around the mat, cushioning both the edges and the frame. It has a maximum weight capacity of up to 220 pounds and comes with a free storage bag. The handlebar is not adjustable, but it does have a height of 23”. The entire bungee trampoline comes with a 2-year warranty, too! The Exercise Bungee Trampoline by Merax will set you back approximately $130. It’s made of tightly woven polypropylene for the surface, fused with maximum strength bungee cords for the best bounce possible while staying completely quiet. The frame is made of high-quality, rust-resistant galvanized carbon steel with a maximum weight limit of up to 220 pounds and is easily assembled straight out of the box – no tools required! This 4.5 ft exercise bungee trampoline also comes with an adjustable stabilizing bar for added support and workout versatility. 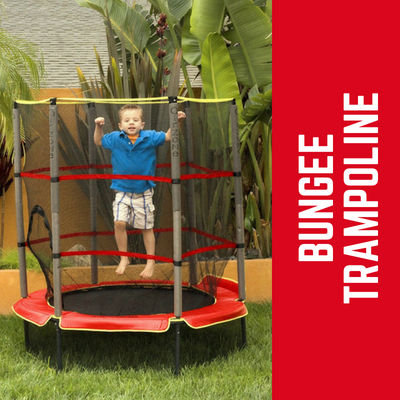 The entire bungee trampoline is approximately 50.4” in size. Before purchasing, you can opt for a 4-Year Protection Plan for $18, or a 3-Year Protection Plan for as little as $6! The 55” Bungee Trampoline & Enclosure by AirZone, though it’s an awesome model that looks pricey, currently only costs a dangerous bargain of $85! The patented enclosure has an entrance that zips open and support poles, which are covered by soft foam for added safety. The bungee cord suspension system makes it completely safe for kids to use. It’s constructed of sturdy, durable steel. You can assemble the entire thing with no extra tools and no drilling. It comes with a 1-year manufacturer’s warranty, too! 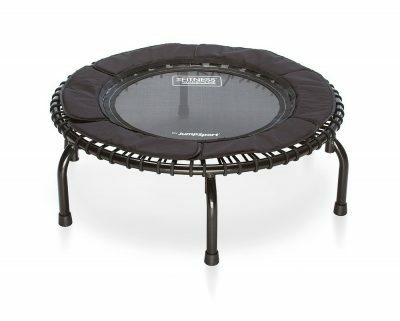 Traditional rebounder springs are a trampoline classic, but that doesn’t exactly mean they’re preferable by any means. For example, sometimes they can snag, break, and fly across the room, possibly causing an injury. Rebounder spring trampolines are usually the cheaper alternative when it comes to buying a trampoline, but they aren’t always the most reliable. A lot of spring trampolines can wear out well before their prime, causing a dip between the mat and the frame. Bungee cord trampolines, however, are built to be safe, give a deeper bounce, and are thicker and more durable when compared to spring trampolines. Where spring trampolines are loud, bungee trampolines are typically silent. Although, because bungee cord trampolines are typically built with better stuff, they are the more costly option. Have You Tried A Bungee Trampoline Harness? Next, we’ll move onto the bigger things. Have you ever seen a large bungee trampoline, where a person has a harness on that is attached to said trampoline? If you haven’t we strongly recommend that you invest in a harness today, and a full-sized bungee trampoline at a later time. Below, you will find our top bungee trampoline harness pick to give you an idea of what they are and to poke you in the right protection. The Kids Half Body Bungee Trampoline Harness by Fusion Climb, at this time of writing, costs around $126. It’s a fully padded waist harness that fits both small and medium sizes, including high-strength Presto buckles that are easy for anyone to buckle up and take off in seconds. There are 2 side attachment points, both made of a nylon material, attached to the harness, which are designed to be used with a full-size bungee trampoline. They’re made to have 2 different colors to ensure that it’s easy to understand how to put it on properly. The harness is designed for kids between the ages of 5 to 11, with size dimensions fitting from Small to Medium. If you switch from a spring trampoline to a bungee trampoline, you’ll no doubt feel the difference immediately. You get a deeper bounce and a trampoline that is built to keep you safe and to last. If you don’t see your question listed below in our FAQ section, get in touch with us and we’ll do our best to help you out! A bungee trampoline is a trampoline that uses a system of bungee cords instead of traditional springs. Yes, bungee trampolines are safe. In fact, when compared to spring trampolines, bungee trampolines are actually relatively safer. Unfortunately, there have been cases of springs breaking and snapping completely free off a trampoline. This is a serious hazard and has caused harm in the past. Fortunately, bungee cords do not break this way, and they won’t fly across the room. Bungee cords aren’t indestructible, but they are tougher and a lot safer compared to trampoline springs. Not always, no. Because bungee trampolines are generally made of tougher stuff, they tend to be more on the expensive side. However, that doesn’t mean you’ll be paying hundreds of dollars to get a good one. If you check out our above review, you’ll see that there are a handful of high-quality bungee trampolines that are under $100.